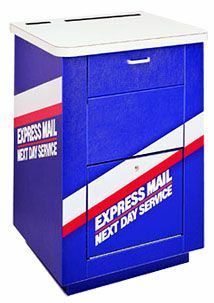 The EXPRESS MAIL� Convenience Center makes it much easier for the postal customer to use EXPRESS MAIL�. The center has a writing desk top, pockets for express envelopes and address labels, and a space for scales and instructions. Express Mail labels are optional. The parcel drop and mail slot are located on the front of the unit. The collection door, also on the front, drops down for easy removal of the mail and is designed for a standard collection box lock. This unit is constructed of blue vinyl-coated 16 gauge steel with a Formica top in silver.